This is one of the reasons why I stand so strongly for supporting Asian cosmetic brands and even more so, the local ones. 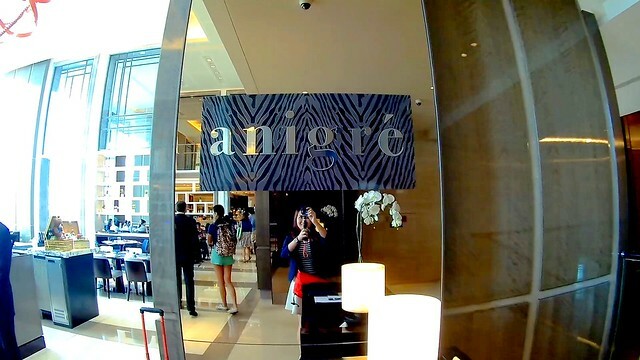 We do have a few cosmetic brands in Singapore, but they are unfortunately not well-known. It isn't that their products loses out to those of the BIG names, but rather it is just a game of marketing and popularity. I personally prefer Asian cosmetics because I find the products to be much more suited for our skin type and shade. 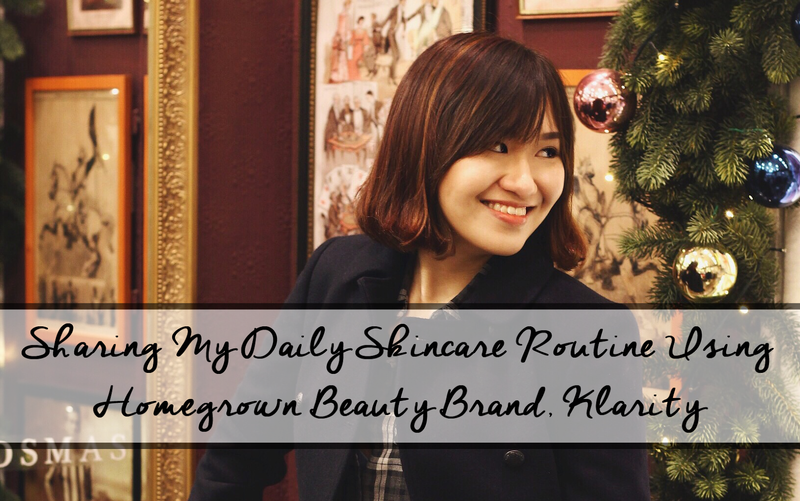 Today I am super proud to share with you guys about five products from a local cosmetics brand Klarity, and you will get to know which of the five are my favourites! Power up your skin with Diamond Glow™ DNA Overnight Nano-Mask, a rich overnight mask that recalls your skin's original DNA and restores to its best condition. It activates your skin's natural moisture defences and promotes your skin's collagen production. The luxurious textured formula glides on and melts into the skin where it works its magic overnight. From the very first application, the skin is illuminated, recovers its natural resilience, suppleness and radiance. The skin's moisture levels are not only restored instantly, but are also kept moisturized deep within throughout the night. The results achieved are like an alternative to your 8 hours of sleep. Revolutionise your cleaning and mask regime with Oxymud™ Cacao Duo Cleanse and Renewal Mask, the 1st Ever Chocolate Oxygenated Mud Mask in the market. The multi-sensory cleansing experience with this unique chocolate mud that changes to oxygen foam upon application. A highly effective mask specifically formulated for skin in need for deep cleansing and nutrient hydration. The unique formula utilises Theobroma Cacao (Cocoa) fruit powder for their ability to enhance skin vitality while encouraging the production of natural emollients. A natural exfoliation enzyme technology smooths, softens and improves your skin in as little as one application. As a result, the skin remains hydrated with improved elasticity for a youthful, radiant complexion. Lasertox is a functional treatment methodology that allows targeted treatments for the improvement of specific concerns. It adopts the idea of laser technology, which reinforces efficient penetration of natural beauty essences into your skin's dermis layer. The Lasertox™ CC Miracle White Lotion helps to restore your beauty with by at least one tone lighter instantaneously. The lotion is enriched with diamond powder, thus giving you the instant glow after application. 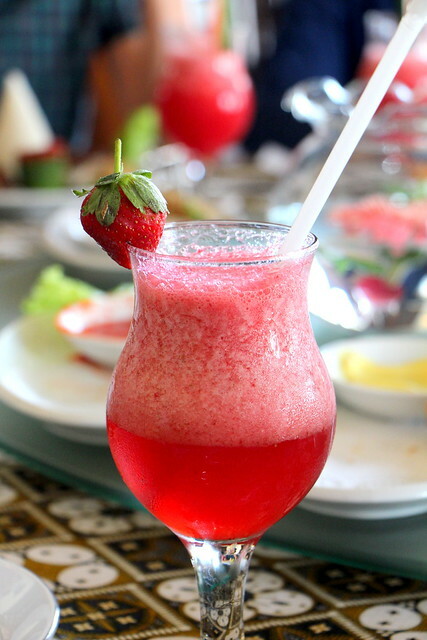 Also enriched with wild rosehip extract, which is a source of powerful antioxidant, it helps to prolong skin youthfulness. With SPF30/PA++ included into the formula, Lasertox™ CC Miracle White Lotion also helps to protect your skin from harmful UV rays, thus preventing photo-aging and dark spots. The 11-in-1 multi function CC lotion is light on the skin and colourant free. It doe not clog pores and leaves your skin smoother and more moisturised, without any trace of stickiness nor an oily shine. It provides instant 3 seconds whitening and protection against the sun. If you are a tired student or worker who burns midnight oil in order to complete your seemingly never-ending work load, you may notice dark circles and fine lines appearing around your eye areas. 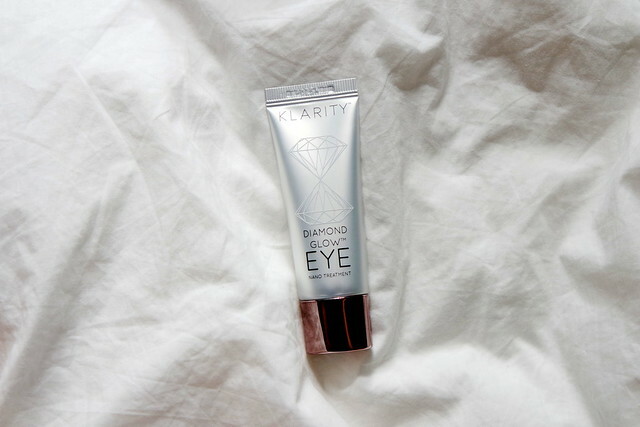 Combat the tired-looking and aging eyes with Klarity's Diamond Glow Eye Nano Treatment that is formulated to give the eye area an instant boost of hydration, lighten dark circles and smoothen fine lines. This eye treatment offers an instant and intense boost of clarity around the delicate eye areas and also provides a revolutionary infusion of hydration, offering 24 hours of continuous moisturising benefits, instantly awakening your eye areas and glowing with radiance. The diamond powder infused in the eye cream is also the key to brightening under eye instantly, helping to diminish your dark eye circles. Experience instant age reversal with The Immortal Elixir which is clinically forumlated to target all skin concerns. An innovative technology breakthrough, the formula acts on three major functions – protect, prevent and treatment. The high concentration of Human Adipose Derived Stem Cells regulate the functions of cells at the genetic level and adapts to the needs of each individual. Skin will be instantly lifted, glows naturally, and pores are visibly smaller upon each application. Empowered to stimulate collagen regeneration and stabilise skin condition, the Immortal Elixir is the key to skin rejuvenation, radiance and youth longevity. There are of course a few of their products that I love more than the rest, but on an overall level, all of these five products have impressed me! I put all five through a solid three months of testing, and I am so glad that I did! None of these products come cheap but they are definitely worth every buck tagged to its price! I saw unbelievable results, and I wished I had taken the photos to show you guys. My top three favourite products are 1) The Immortal Elixir, 2) Diamond Glow™ Eye Nano Treatment, 3) Oxymud™ Cacao Duo Cleanse and Renewal Mask. Firstly, let's talk about The Immortal Elixir. I was using it previously as an after-makeup setting spray (you can see it from my video review) and wasn't quite impressed with its results. I was about to chuck it aside but had second thoughts, I had a nagging feeling that I wasn't using it right. I decided one day to try using it as a before-makeup face priming spray, and damn that was it! I had found its true purpose. Using it as a before-makeup spray helped to give my face a last-minute moisture boost, that aided in a smoother makeup application and also helped my makeup to last longer in a day. I have since included it in the ranks of must-haves in my makeup routine! 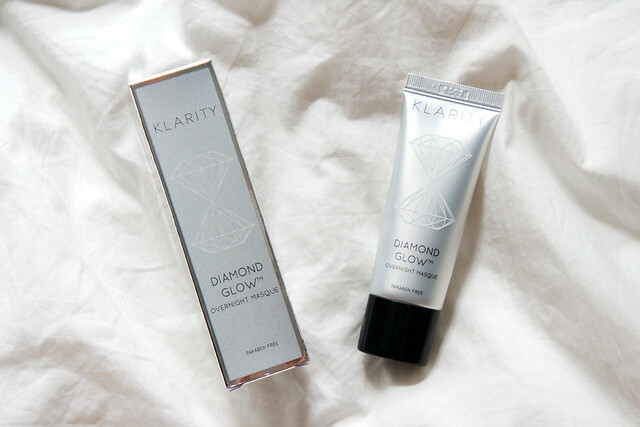 Secondly, the Diamond Glow™ Eye Nano Treatment. This is another one of the products that failed to impress me during my first attempt, but I gave it some time and I saw its effects! Due to countless of late night blogging, I have terrible dark eye circles and fine wrinkles around my eye areas (like an old granny). 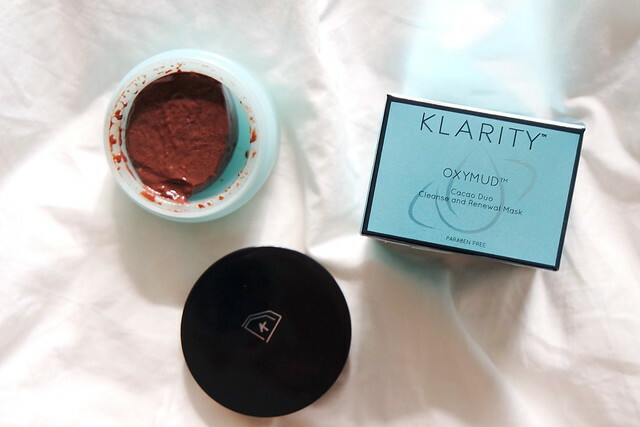 Lastly, the Oxymud™ Cacao Duo Cleanse and Renewal Mask. It was actually a tough call between the mudmask and overnight masque, but I chose the former as I was impressed with its 4-in-1 functions. If you have been following my Instagram and Youtube videos, I have been raving endlessly about this product. It acts as a makeup remover, exfoliator, cleanser and detoxifying mask. For best results, I would highly recommend the use of this mudmask paired together with their Diamond Glow Overnight Masque. The combination removes dead skin cells and rejuvenates the skin overnight, and come morning your face will be radiating with glow and moisture! I could hardly believe my eyes when I looked into the mirror, I even leaned in for a closer look!!! You've really got to try it for yourself. The one product that I have yet to talk about is the Lasertox™ CC Miracle White Lotion. 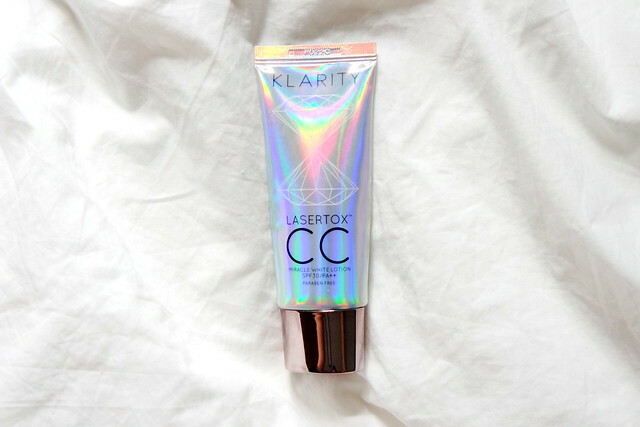 I love this product as well, but unfortunately the other Klarity products have outshone this one. I would describe this product to be a good fit for those looking to wear light makeup in the day! How I would usually wear it out is to apply a thin layer on for minimal coverage and sun protection, and then add on some blusher and slight bronzer to give my face more colour. The issue that I have with this product is its whitening effect, which works against someone of fair skin (like myself), and only does to make me look ghostly-pale – hence the addition of blush and bronzer for colour. If you are keen to purchase any of these products, you can find them at SASA, BHG, Pink Beauty Stores, Sephora Online, Zalora and secretive.sg. For more information on the products, head over to their official page here. 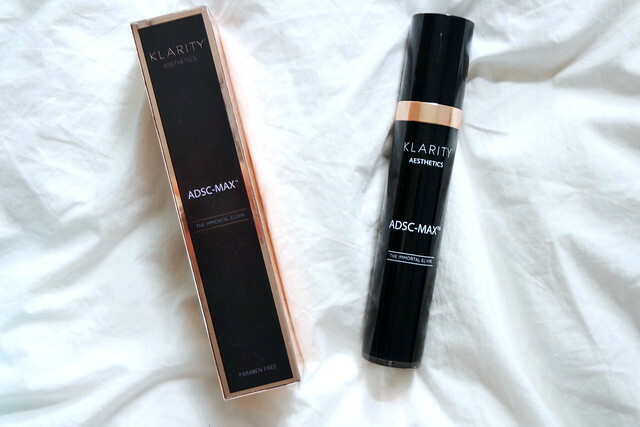 Note: The products in this post were sent by Klarity for honest review. I am changing the way that I write my posts as I realised that with a switch of my niche (ie. 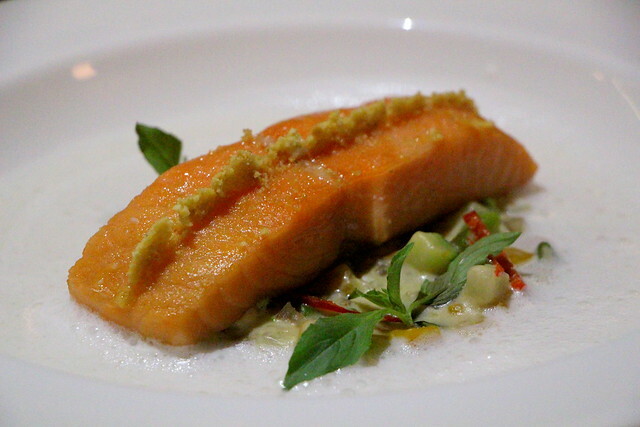 food to beauty), it becomes harder to write in a third-party informative manner. Of course, I will still retain writing in the informative fashion when I am doing beauty reviews, but I thought it might also be cool to get a little closer and personal with you guys, as well as to keep you updated on the various events that I have been running for. 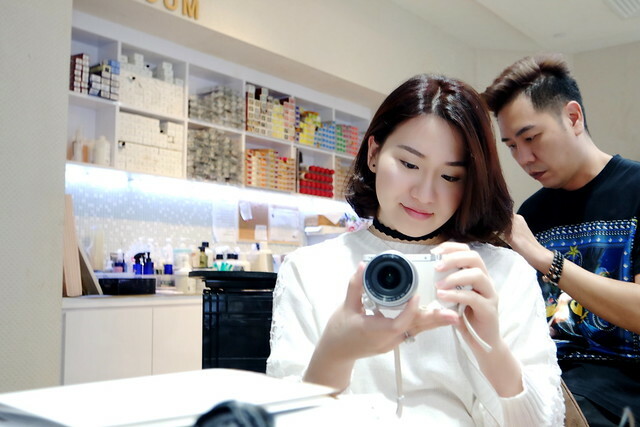 These days I go for beauty or fashion events – you can always find the latest updates of my events on my Instagram – and I am so thankful that I have Kenjo Salon to keep my hair neat, slick and ever beautiful! 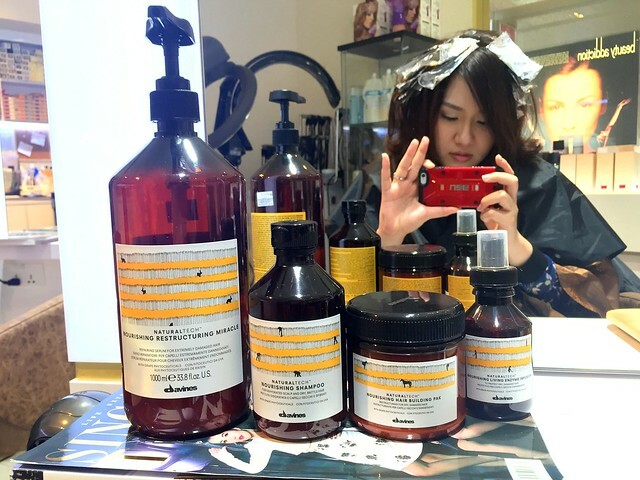 On my second session at Kenjo Salon, Joseph put me on Davines Treatment and combing my hair has been a breeze since. Davines is widely known for using all natural raw ingredients from plants to produce their products, there is absolutely not a strand of chemical in any of their treatments. All of their formulas are free from parabens while shampoos are also free from sulphates (SLES and SLS). The Nourishing Series that I had undergone promises nourishing, revitalising and fortifying results that are great for the scalp and dry, brittle and damaged hair. I am no longer sporting any runaway fray ends on my head, and my hair looks purrr-fect! 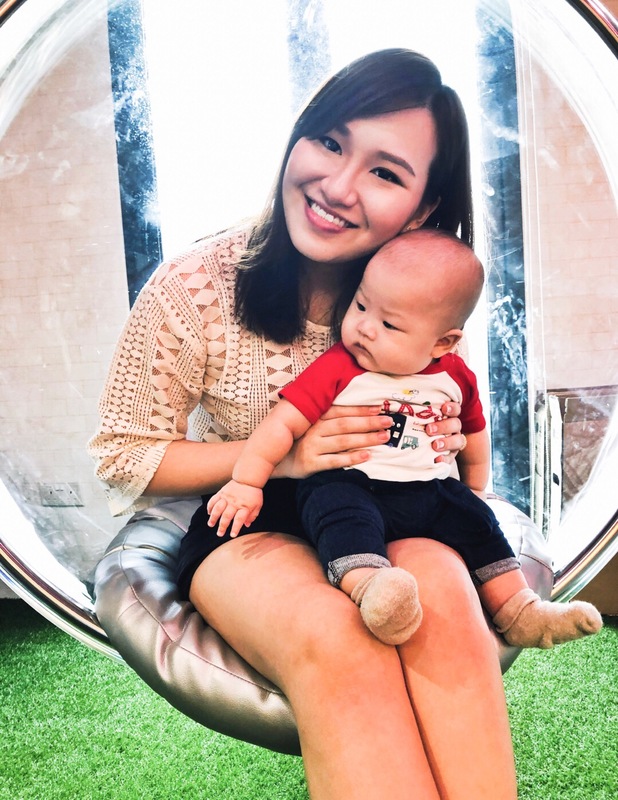 I shared with Joseph that I was to attend Singapore Fashion Awards on one of the past Friday nights and would like to drop by the salon to get a wash + blow-dry. 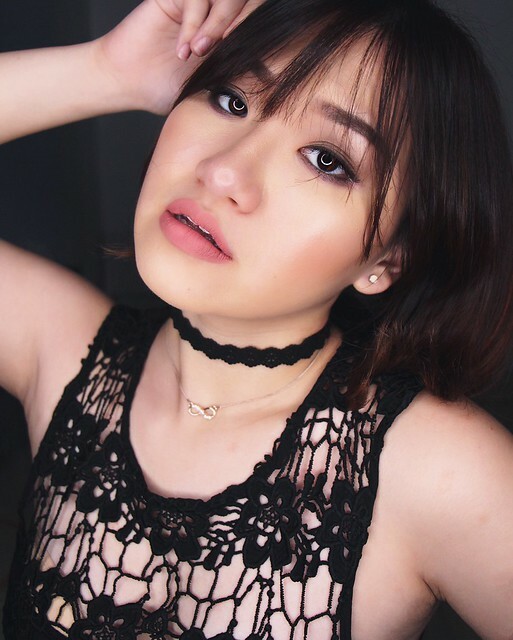 He added on a makeup session with their in-house makeup artist and on the Singapore Fashion Awards night, my makeup was totally on-point! My smokey eye makeup that night! Amaryllis, their makeup artist, gave me a smokey eye look to match my dark outfit. Their makeup service is available at any time but it would be best to make an appointment beforehand. There is an ongoing hair + makeup promotion right now at $150 and a student special at $130. This is great for working adults attending their company's D&D or students going for prom/graduation night! Go check out now at (+65) 6238 8083. Christmas is coming up soon and Kenjo Salon has also prepared some gift sets that you can gift to your family and friends! Know of anyone who has troubled hair? Get them either of these package which comes with hair strengthening Mucota AIRE+ treatments! For more information on Mucota AIRE+ click here. Note: This post was sponsored by Kenjo Salon. 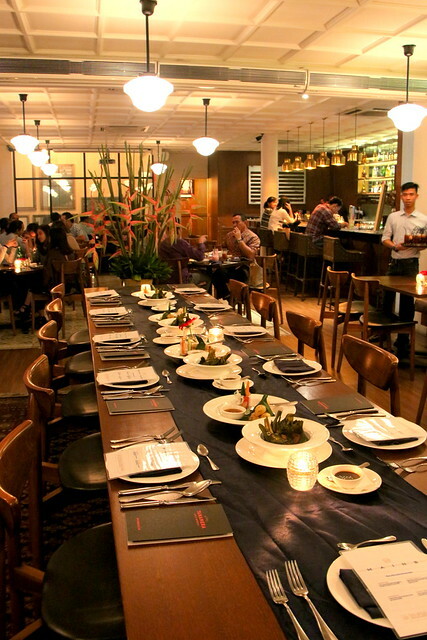 Makan@Jen has rolled out a new dining concept, set to appeal to avid prawn lovers! 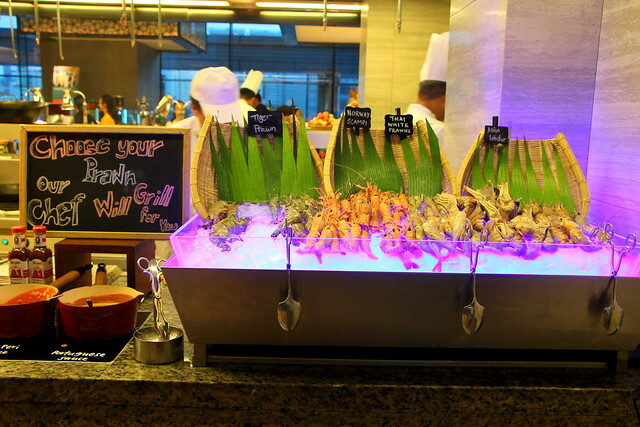 Paired with the daily Makan@Jen buffet, the prawn fiesta will be featuring four different types of prawns that have been specially flown in from around the globe. 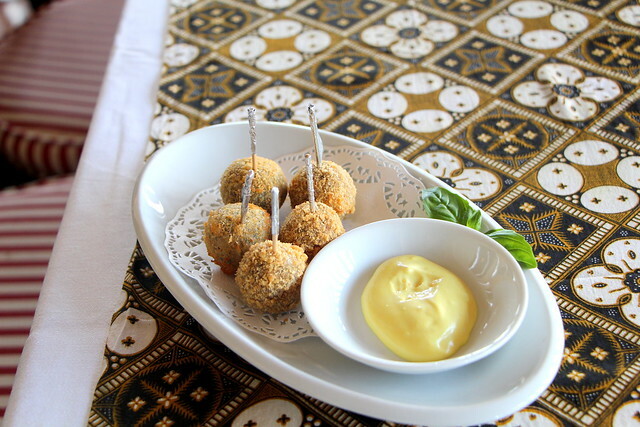 The restaurant will be preparing the prawns in an array of culinary techniques and flavours, set to either wow or induce a sense of nostalgia. 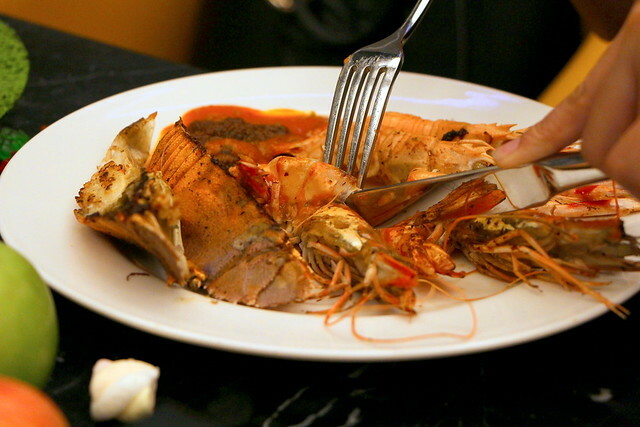 The four types of prawns are Thai White Prawns, Indian River Prawns, Norwegian Scampi and Vietnamese Yabbies – with the former two types being similar and thus familiar to the ones we frequently have access to, and the other two foreign cousins resembling crayfish or lobsters. 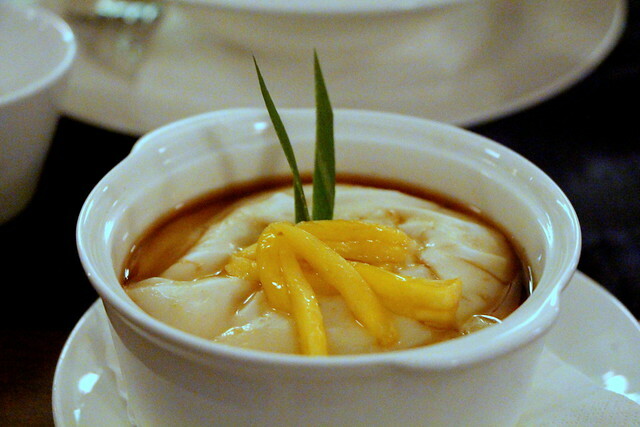 The prawns will be prepared in a number of ways depending on their texture and flavour, and can either be simmered in a lightly alcoholic broth, stir- fried, steamed, baked and even coated in batter and fried to a golden crisp. A variety of prawns and crayfish up for your selection! 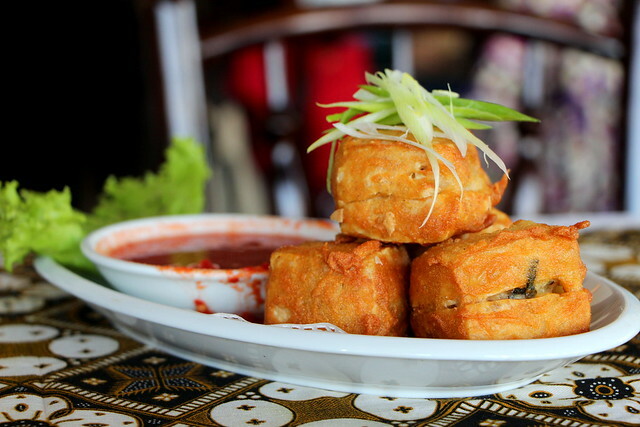 Makan@Jen will be showcasing a plethora of flavour profiles from across numerous cuisines and cultures such as Cantonese, Vietnamese, Spanish, Portuguese and of course, local Singaporean. 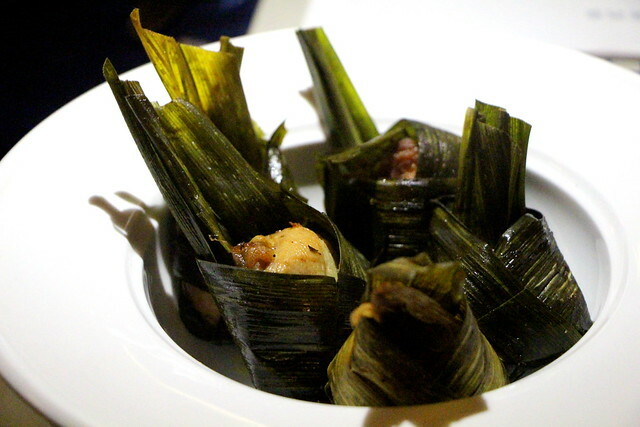 The different prawn dishes will be divided across 3 different menus, which will be rotated throughout the promotion period. Fresh prawns up for grilling! Take your pick! Dig in with your friends, either fuss-free with hands or a refined fashion with a fork and knife. 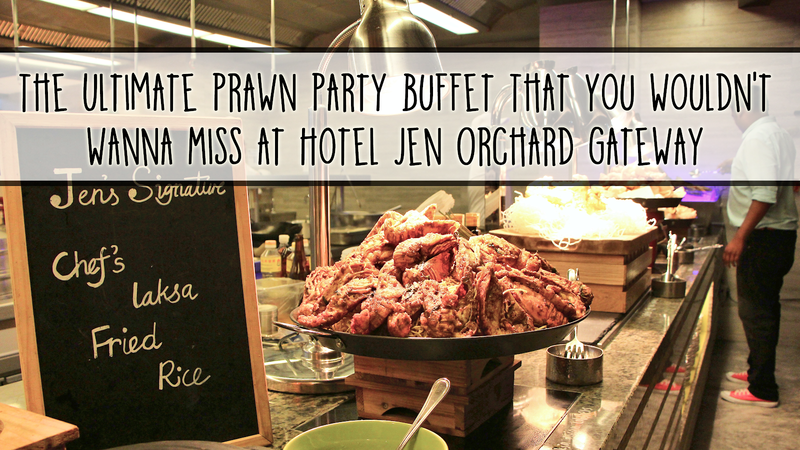 This post was sponsored by Hotel Jen Orchard Gateway. Combing my hair is a frustrating task. It has always been a nightmare that comprised of more yanks than a smooth brush-thru. I hate admitting to this anyone but years of colouring, bleaching and perming my hair has turned my once-lustrous and healthy hair into a pit of tangled hay-like mess that I termed as "my hair". 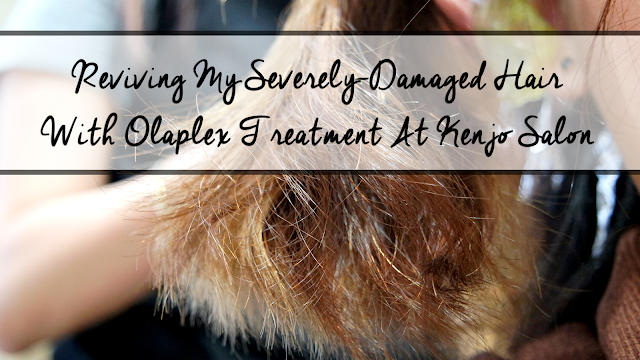 I walked into my sponsor hair saloon Kenjo Salon, eager to get a dye job for my colour-mismatched hair roots but at the same time I feared that my hair would become much more brittle and dry. 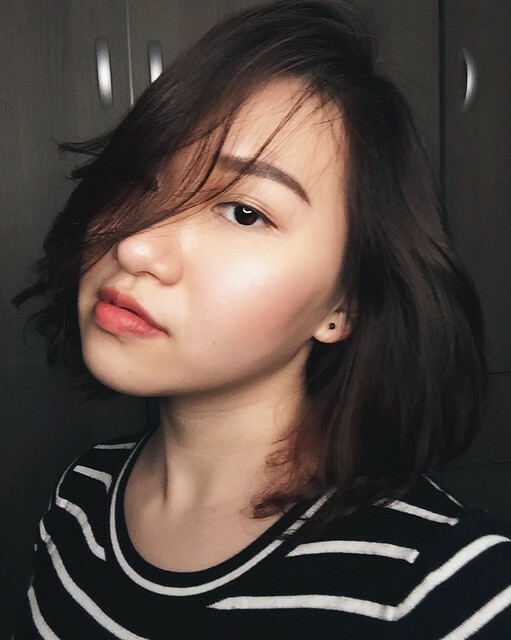 For those who are wondering, yes I switched a hair saloon due to some terrible miscommunication with the previous hair studio – it is a bad experience that I would much prefer not to recall. 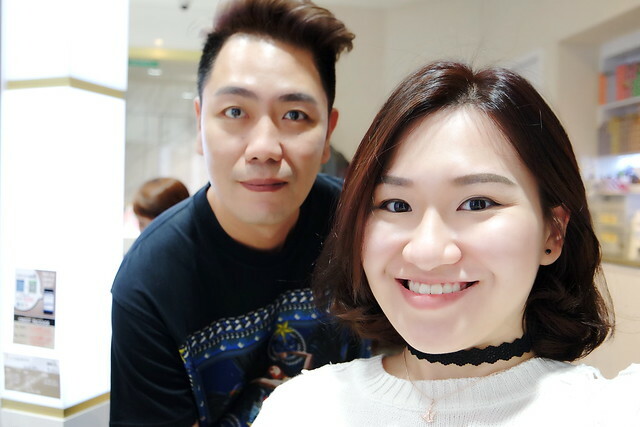 Joseph, boss of the salon and my stylist, eased my worries as he introduced me to two of their latest hair treatment products: Olapex Treatment and Mucota Treatment. 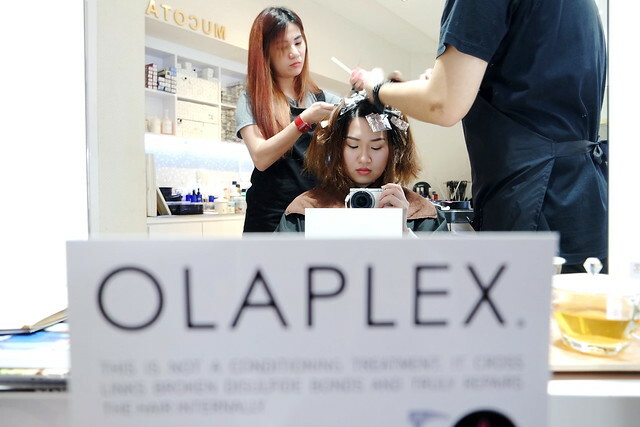 Olaplex has been around the hair industry for a couple of years now, and it has received all the raves in the States for the miracle results that it has produced! Olapex is bond multiplier produced by two chemical engineers who weren't familiar with the hair industry at all. This product is unlike any other in the market as it actually links broken disulfide bonds in your hair, thus allowing your hair to restore its strength, structure and integrity like before. It is not a conditioner as it does not coat the hair in silicone nor in protein. 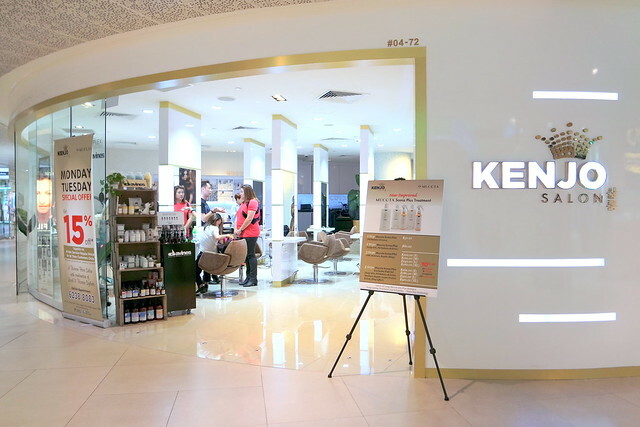 And Kenjo Salon is one of the few hair studios in Singapore that has brought the product to our local market and has it made readily available for our use! 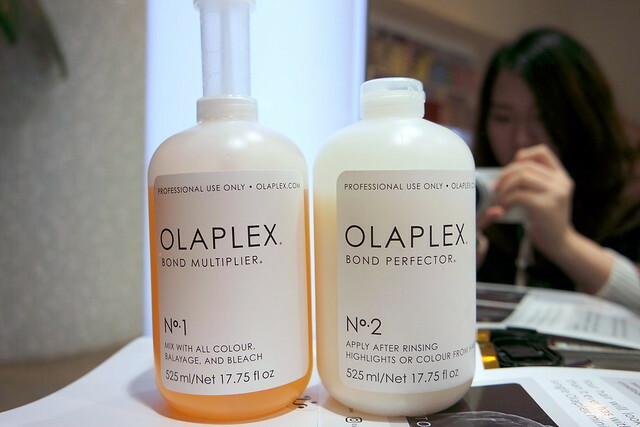 To use Olaplex, it is mixed directly into your hair dye during preparation. This would result in healthier, stronger and shiner hair after the dye job, and would also allow the colour to be retained for a longer period of time. The repaired disulfide bonds helps your hair to be less porous, thus the addition of it to your hair dye is like hitting two birds with one stone – you get to repair your hair while getting a new dye job that would last longer! Our hair is mostly made up of many layers of proteins, lipids (fats/oil), amino acids and polysaccharides. These layers are bound together by the cell membrane complex (CMC, for short) which helps our hair to retain important components such as proteins, oils and moisture. 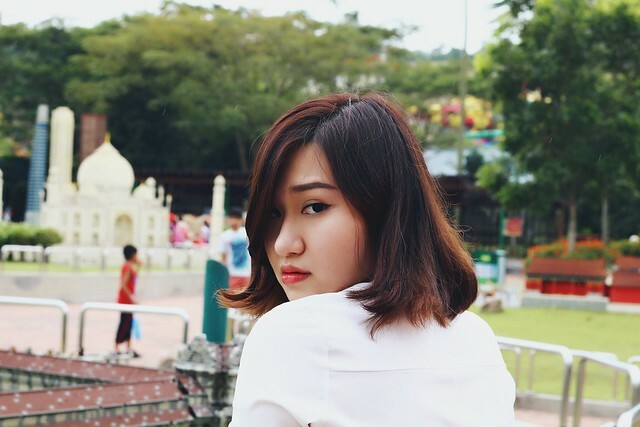 However through the years, the CMC and other essential compounds would break down and diminish due to aging, and the effect is also multiplied when our hair is put through heat treatment, UV radiation or chemical treatment. Thus Mucota has developed a range of products which utilises the advances in material sciences and biotechnology to help restore and protect our hair. It replaces important natural elements that make up the intercellular components of our hair. Essentially, these five steps would help to prepare and restore, moisturise and condition, intensively repair, and protect and seal all the goodness into our hair! During each step, the key product would hold a significant chemical element that is crucial in repairing our hair; such as hyaluronic acid which is great for supplementing moisture, ceramide-like substances to create a barrier and prevent moisture and CMC from flowing out of our hair. 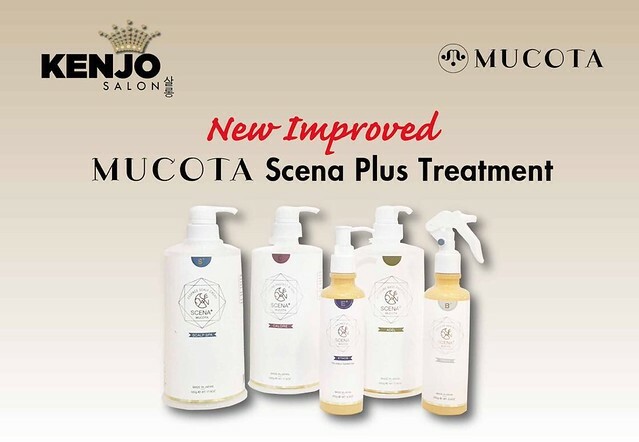 For more specific details on Mucota products, you can check it from Kenjo Salon's website here. Mucota helps to repair my scalp and restore moisture into my hair! See that smooth comb-thru? It hasn't happened in a long time! Picture with Joseph, thanks for the awesome hair-do! It is officially three and a half weeks since. Combing my hair is not a disaster like before, where I had to physically thug my comb outta my hair. The effects have lessened a little, which is expected due to the factor of time and that I've only received the treatment once. But hey I'm still getting a pretty decent comb through without relying on a multitude of hair smoothing serums/lotions and thus this makes it a hell lot better than before! As for my hair colour, they weren't kidding when they said that Olaplex helps it to last longer. Joseph helped me to pick the latest trendy colour in the Korean hair industry, Ash Brown, and jazzed it up a little with some Red and Copper Highlights. The obvious colour for the first two weeks was the Ash Brown base, but gradually the Red and Copper Highlights started peeking out! I can't wait to see how my hair colour would continue to transition – my hair is looking better and better each time I stare into the mirror! 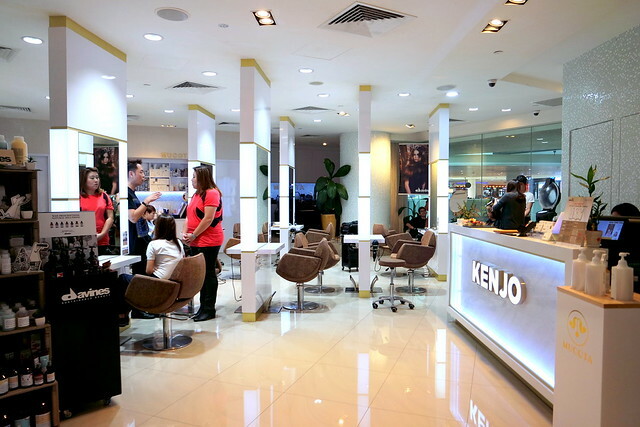 You can check out the available services at Kenjo Salon here and because you are my reader, quote 'sophleow' for 15% off all services at Kenjo Salon (*not applicable for 20% student discount). This post was sponsored by Kenjo Hair Salon. 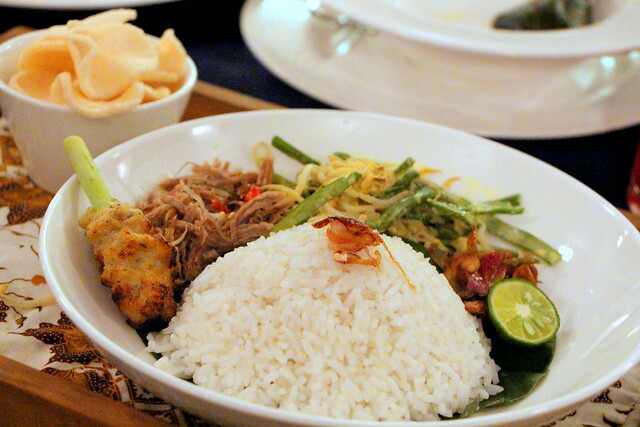 Jakarta, the capital and most populous city of Indonesia, is a mere two-hour flight away from Singapore. With a rewarding currency exchange rate of 10,000 IDR to 1 SGD, it makes for an incredibly affordable escape when a short vacation is much needed! 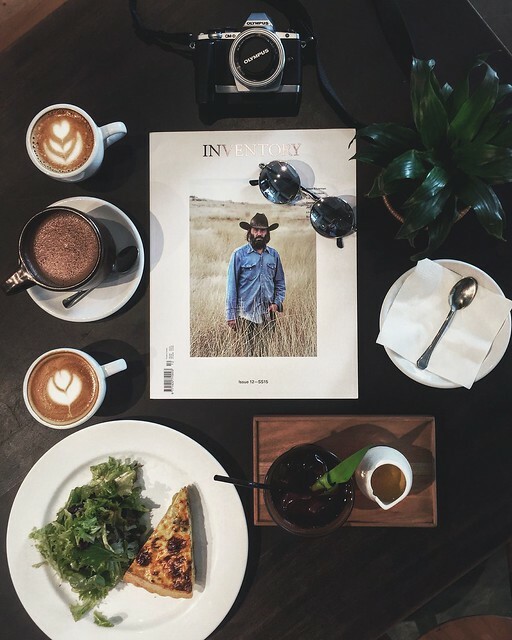 In this travel guide, I will recommend 13 places that you can stay, explore and eat in this fabulous cosmopolitan city. Read on for more. 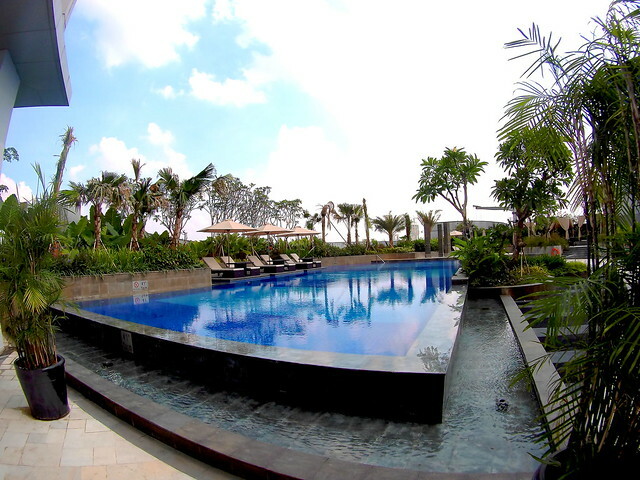 Sheraton Grand Gandaria City is the second Sheraton to debut in Jakarta, and also the first Sheraton Grand Hotel in all of Indonesia. 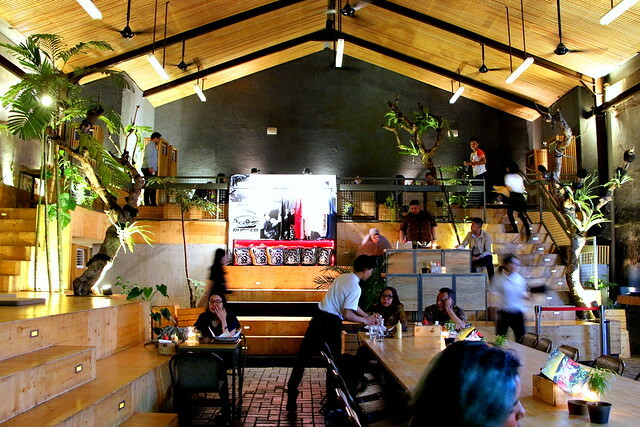 It is located in the South side of Jakarta, the hippy part of this cosmopolitan city. 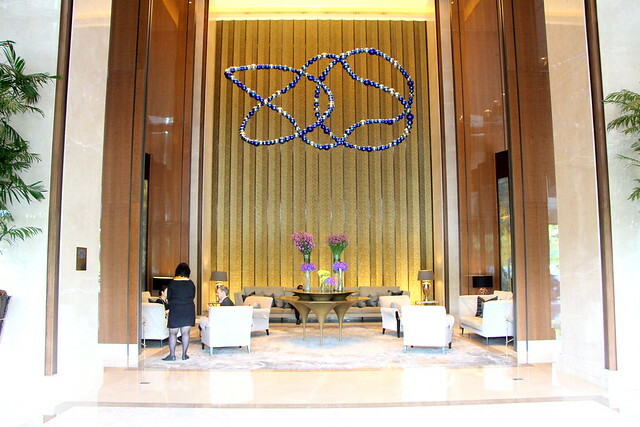 The 4.5-stars hotel boasts 293 contemporary guestrooms and suites, fitted with the Sheraton brand signature amenities and services – including Sheraton’s Signature Sweet Sleeper Bed. The hotel is also equipped with state-of-the-art fitness centre (with a personal trainer), an outdoor pool, and an ultra-modern Sheraton Club Lounge. 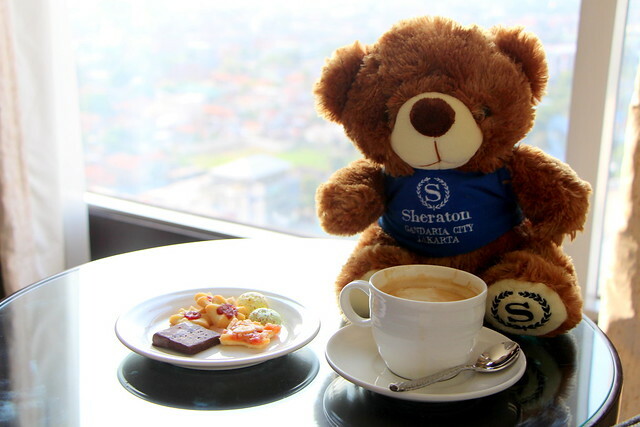 Club-level guests can enjoy complimentary breakfast and all-day refreshments at the Sheraton Club Lounge while taking in the breath-taking panoramic views of Indonesia’s urban skyscrapers. 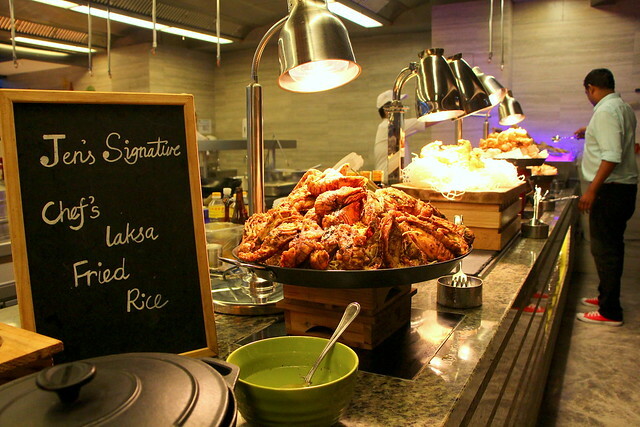 Enjoy all-day dining at Anigré, which serves international cuisine as well as local delicacies. 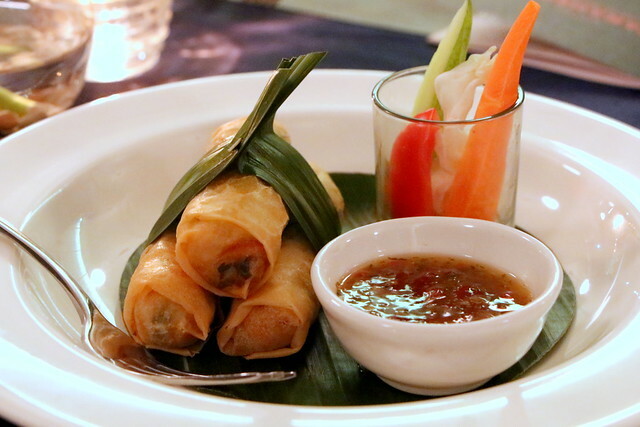 The restaurant welcomes guests with a chic and convival décor, and is able to sit up to 165 guests with semi-private rooms available for private functions. 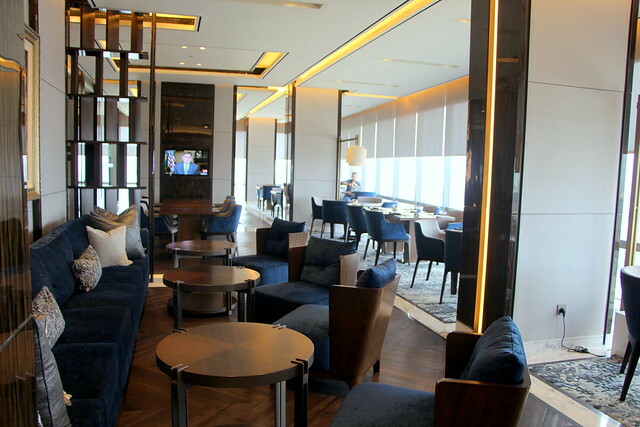 In the lobby lounge, you can enjoy Sheraton’s Paired Programme, a reinvigorated food and beverage program. 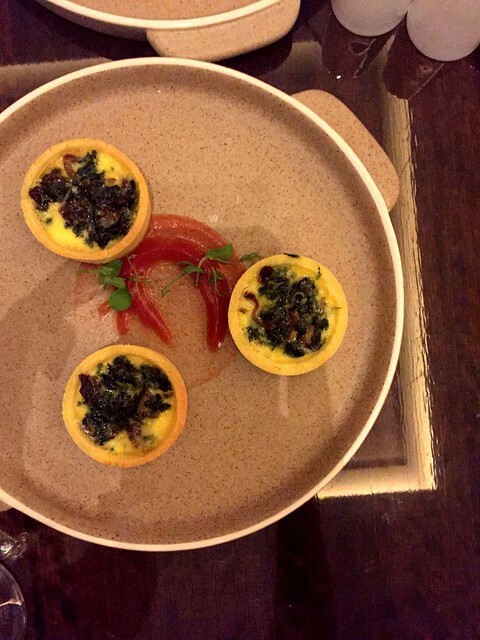 Sip on premium wines or take a chug of local craft beers together with expertly-matched small plates of food. 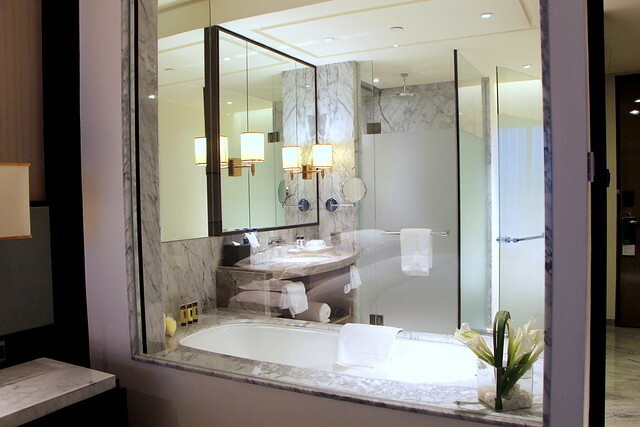 It would be an exquisitely relaxing way to end the night before heading back up to your room! 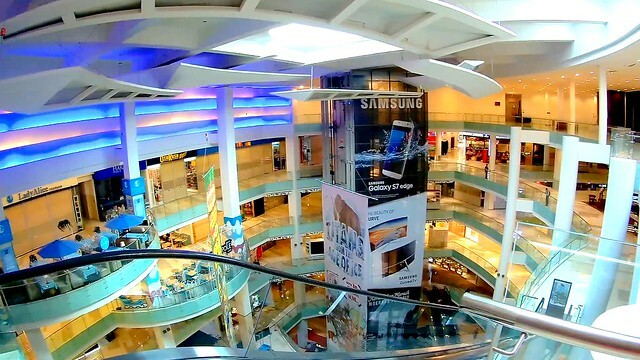 Sheraton Grand Jakarta is also part of the Superblock Gandaria City Complex, which includes a retail shopping mall, convention and exhibition facilities, a helipad and various restaurants. The hunt for this polka dotted pumpkin statue is on! 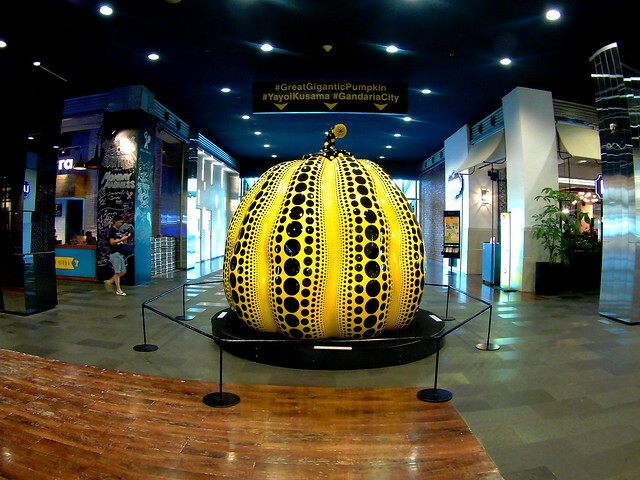 This giant yellow pumpkin is created by world renown Japanese artist, Yayoi Kasuma, who has an intense love for these vegetables that kept her alive during the Second World War; her passion for pumpkins has since been an inspiration for her artworks. Yayoi Kasuma’s pumpkins are scattered at various discreet locations throughout the globe, and people have been travelling the world just to get a picture of it for bragging rights. You can check out all the pictures taken on Instagram with the hashtag #yayoikasuma. 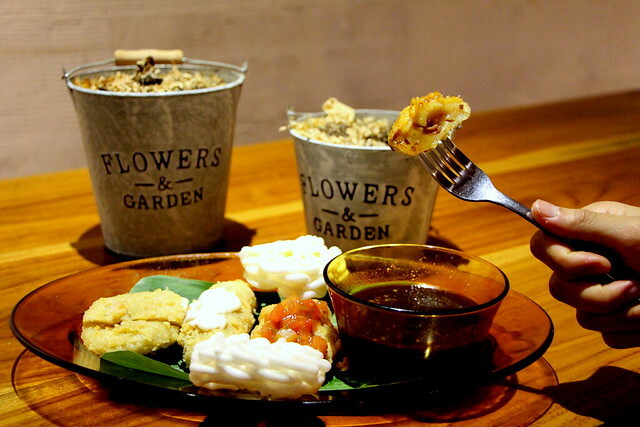 Or you can check it out for yourself at Gandaria City Mall. 3. 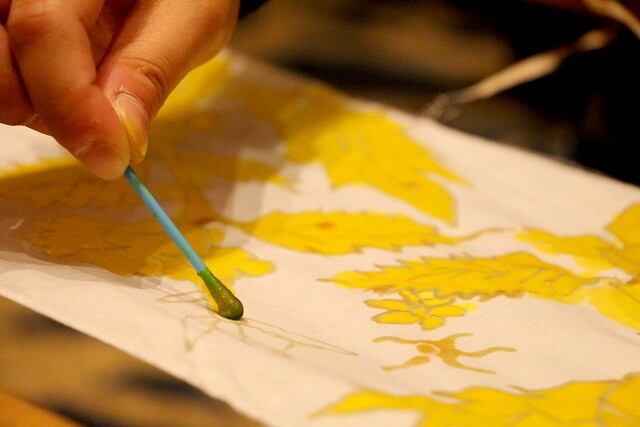 Make your own batik! One of the must-buy souvenirs from Indonesia would be batik, an intricate-patterned cloth made using a wax-resistant dyeing technique! The cloth can then be used to make an apparel, a bag, shoes or a hat! Instead of buying batik from a shop – which is what most people would do – why not give batik-making a go? 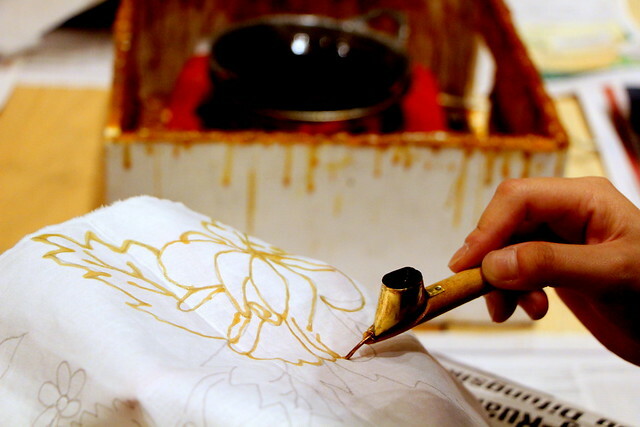 There are tonnes of workshops throughout Jakarta offering batik-making courses! You will be taught to identify an authentic handmade batik from a printed one, and the memories reaped from making your very own one-of-a-kind batik to give as a souvenir to your loved ones back home. After having watched one of these traditional puppet shows, I can safely conclude that they have been understated and deserve more recognition. 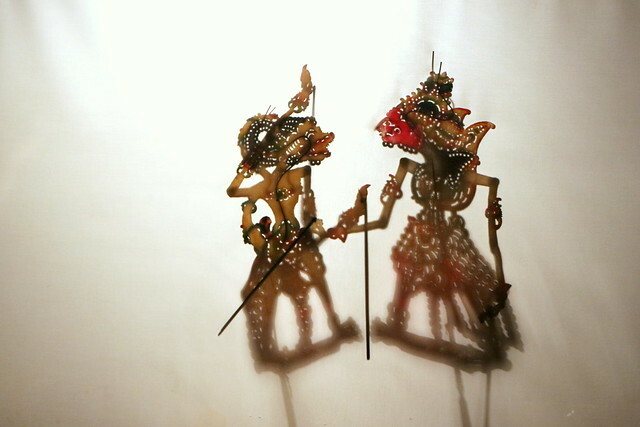 No fancy science tech is used in the performance but the simplicity of a wayang kulit (shadow puppet show) was the very thing that captured my attention. 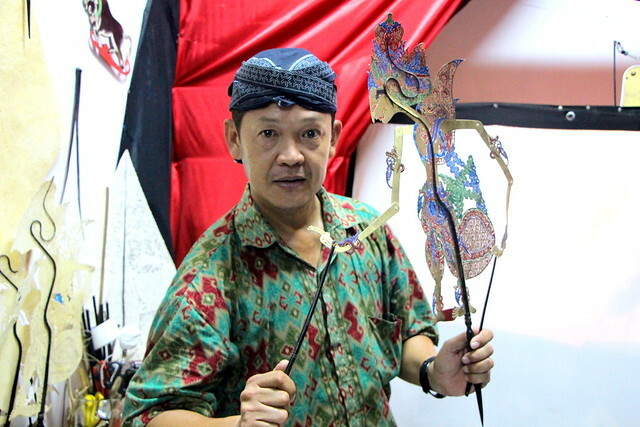 You can catch a shadow puppet show at Wayang Museum on every second, third and fourth Sunday of every month, from 10am to 2pm. The show would last for about an hour. 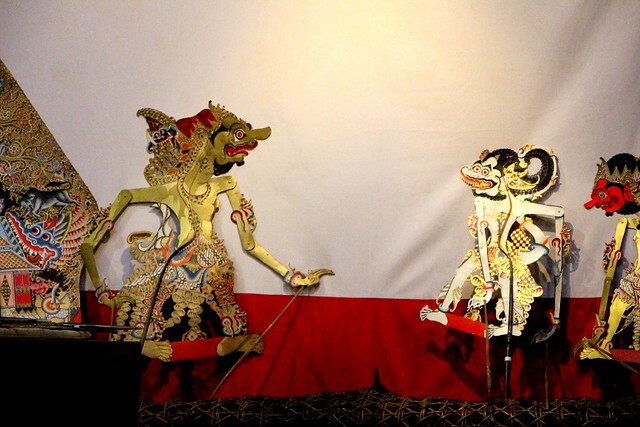 Alternatively you can walk around Wayang Museum for a fascinating display of the various puppets used. 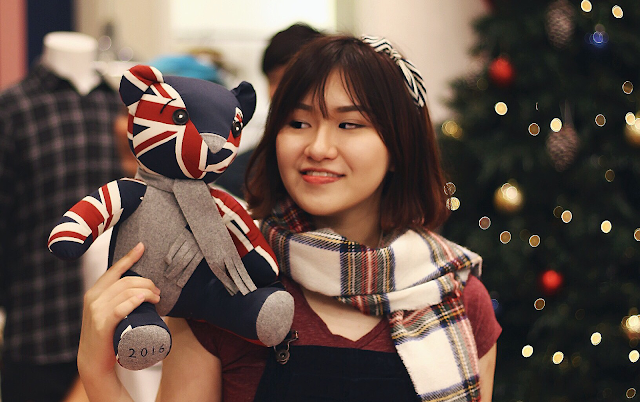 Purchase one of these puppets home as a souvenir for SGD15 (for a small one, approximately 15cm in height) or SGD40 (for a medium size one, approximately a forearm’s length long). 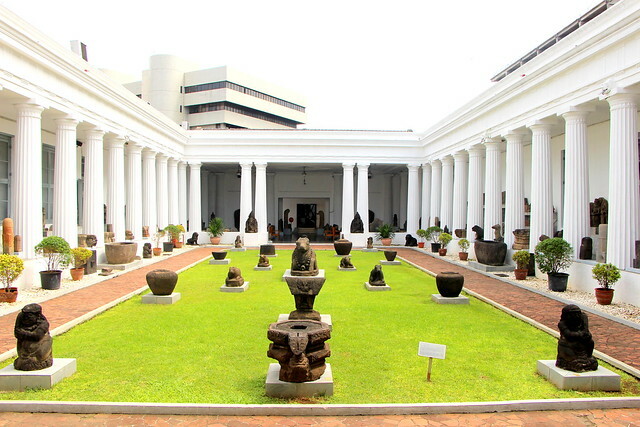 The National Museum of Indonesia (or known as ‘Museum Gajah’) has a wide collection of artefacts that records most of Indonesia's history. 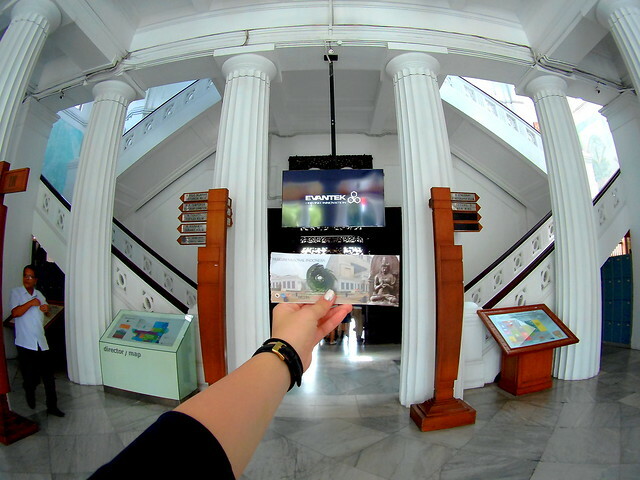 Museum Gajah is one of the finest archeological, historical, ethnological and geographical museums that can be found in Southeast Asia. 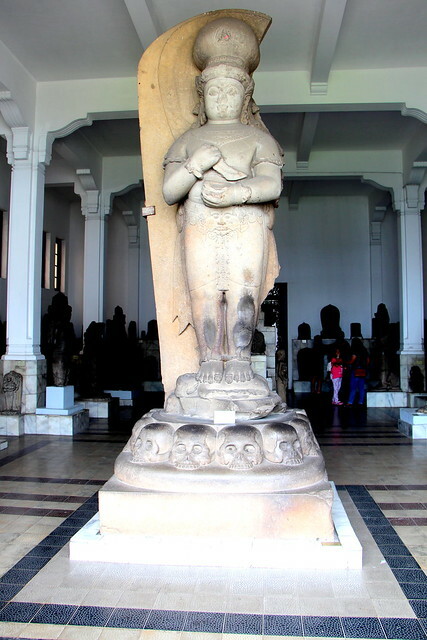 It holds a collection of 61,000 prehistoric and anthropological artefacts, and 5,000 archaeological artefacts from all over Indonesia and Asia. From tribes who believe that sleeping on the skull of their loved ones would bring them answers to their questions in life, to indigenous women who believed that blackening their teeth is a sign of beauty, learn about the various traditions and beliefs of Indonesians throughout the different regions of the country. Sign up for a free tour of the museum in your language of choice, including English, French, Korean and Japanese. 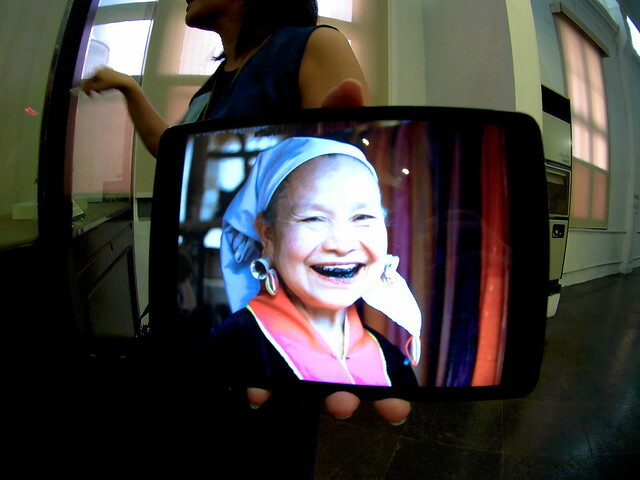 Do note that the museum practices double-pricing – foreign-looking people are charged at a higher price. 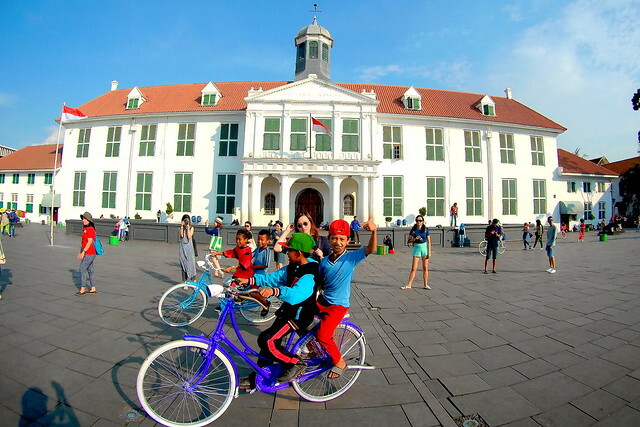 Fatahillal Square (formerly known as Batavia City Square) is home to several museums such as Jakarta History Museum and Wayang Museum. The iconic city square famous for being the “old downtown of Jakarta”. The Square is now a neighbourhood attracting tourists with its history and appealing Dutch architecture. 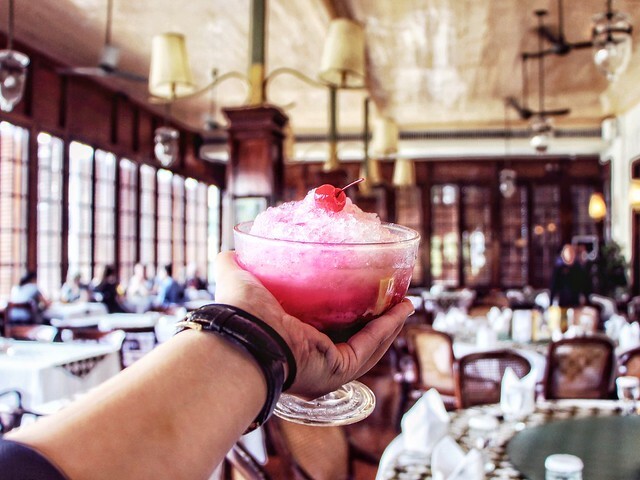 Located on the northwestern corner of Fatahillah Square, Batavia Café is set in a 200 year-old building and famous for its iconic portrait-full wall. 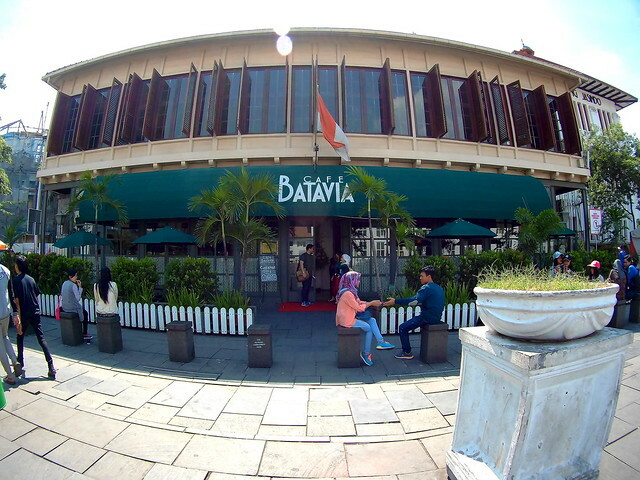 Batavia Café is the second oldest building in central Jakarta (after the Fatahillah museum) and gives off the vibes of 19th century Jakarta during the colonial era. 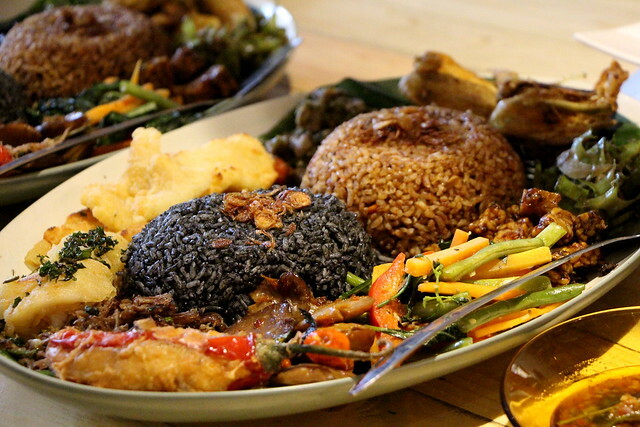 The restaurant serves delicious traditional Indonesian cuisine such as Nasi Campur Meneer, Batavia Nasi Goreng and Es Campur Betawi. 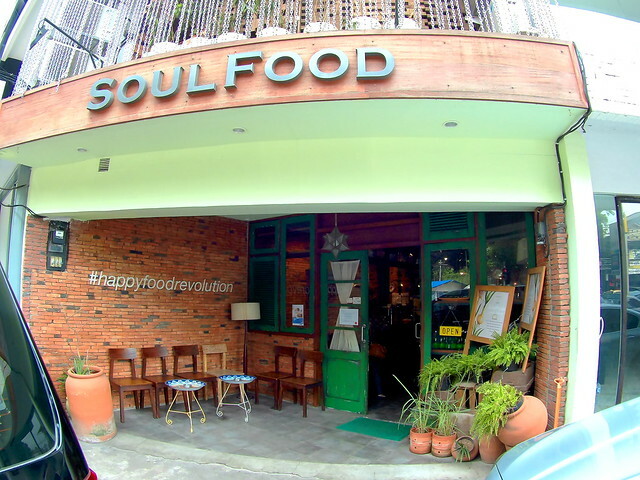 Soulfood Kemang started its operations in late 2015 and is now considered a “hipster Indonesian restaurant”. 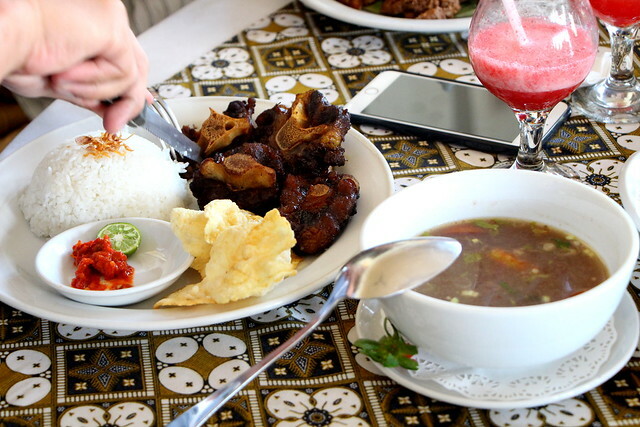 The restaurant offers authentic Indonesian cuisines using the best ingredients available within the country, and is set in an environment furnished with assorted vintage ornaments that used to exist in homes of Indonesians back in the days. 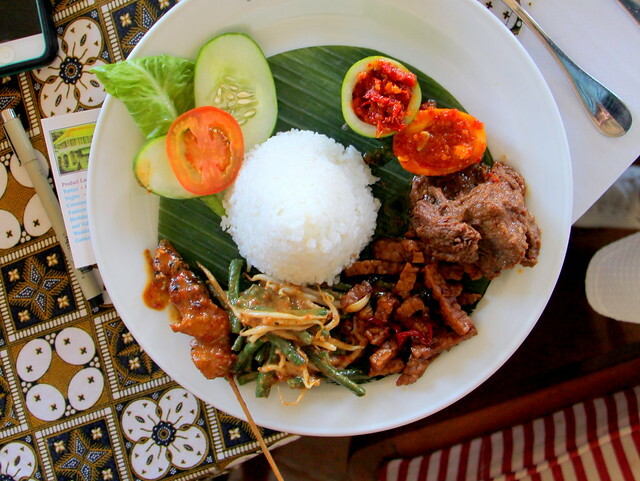 Do be warned that their food is not for non-spicy eaters and the flavours of the food is more suited for the local palate. 9. 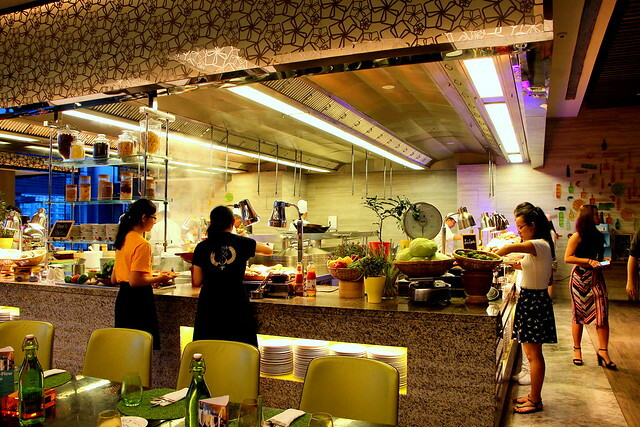 Dining at Letter D.
Letter D. is the latest brain-child of acclaimed chef Degan, who appeared in Indonesia Masterchef as one of the judges. 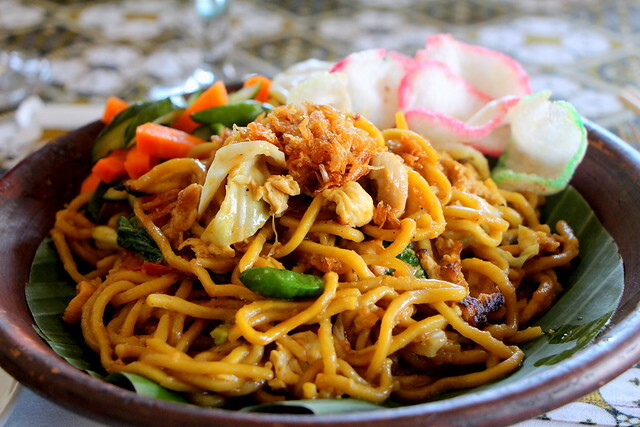 Their menu consists of Asian-fusion dishes that combines seasonal Indonesian flavours with a brasserie-twist. 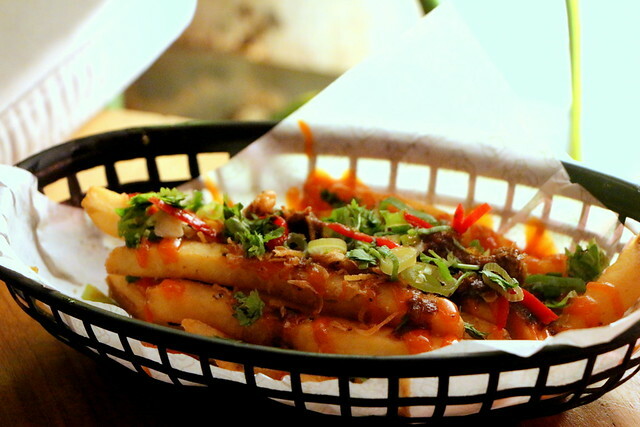 This international gourmet burger joint comes as no surprise as we have a franchise of our own here in Singapore, located in Potato Head Folks at Keong Saik Road. With that being said, the menu between the two franchises differ. 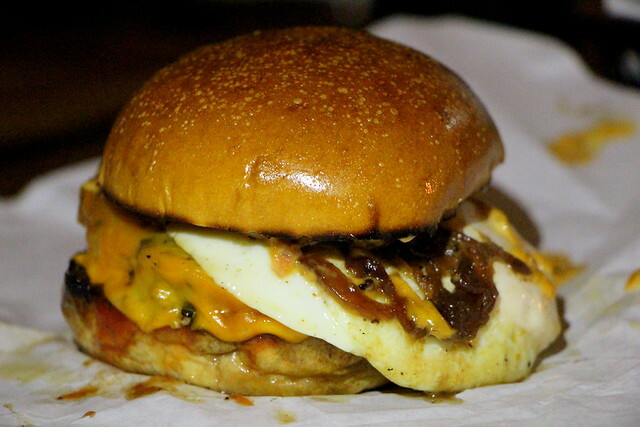 The signature burgers at Three Buns – such as Baby Huey, Burning Man and Four Floor – are served in both outlets, however Jakarta offers unique burger flavours – such as Street Truff, Piggie Smalls and Big Krabby Kane – which are only found in the Three Buns Senopati restaurant. 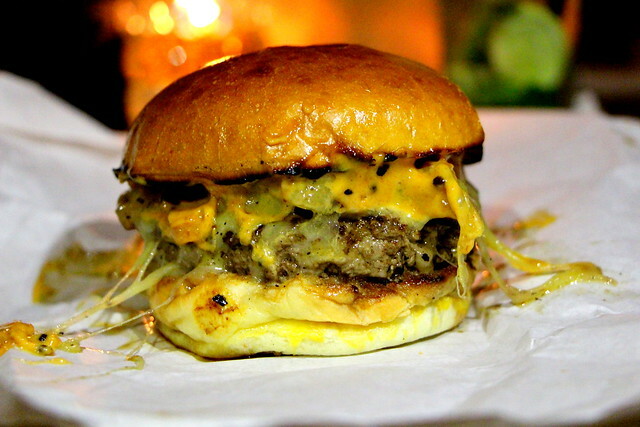 P/S: I am in love with their Piggie Smalls burger. There is nothing better than beef and bacon sandwiched between perfectly grilled buns! 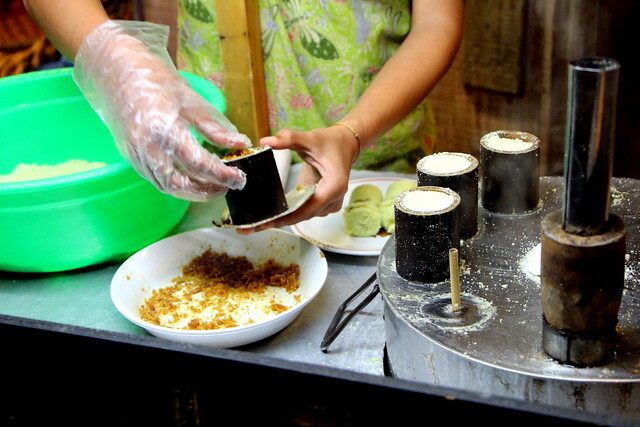 Always wanted to try Indonesian street food, but you’ve been afraid of the food being unclean or of the scorching Jakarta heat? 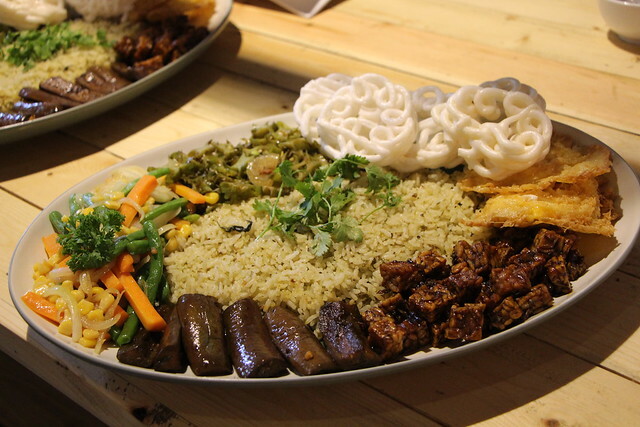 Well you can now fulfill all of your street food desires at Dapuraya, a newly-opened, fully air-conditioned, indoor food court that gathers all of Indonesia's local flavours. 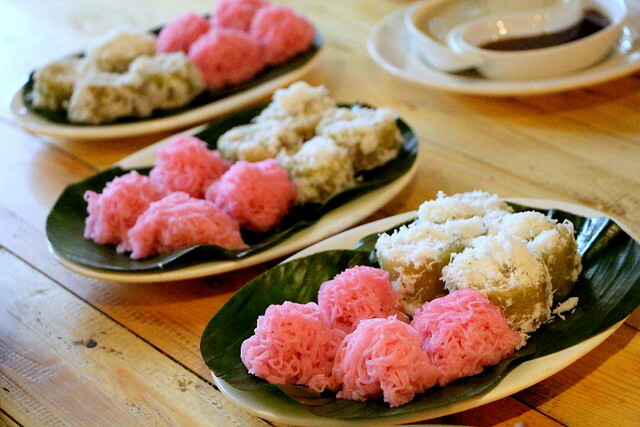 Here are some dishes that you can try: Kerak Telor (a traditional rice and egg omelette dish), Es Selendang Mayang (sago and rice flour cubes served cold with coconut milk and palm sugar), Serabi Solo Niki Mawon (Indonesian style pancake made with rice flour and coconut milk, topped with jackfruit or chocolate), Kue Putuh (Gutinous rice flour with sweetened grated coconut steamed in a bamboo cylinder). 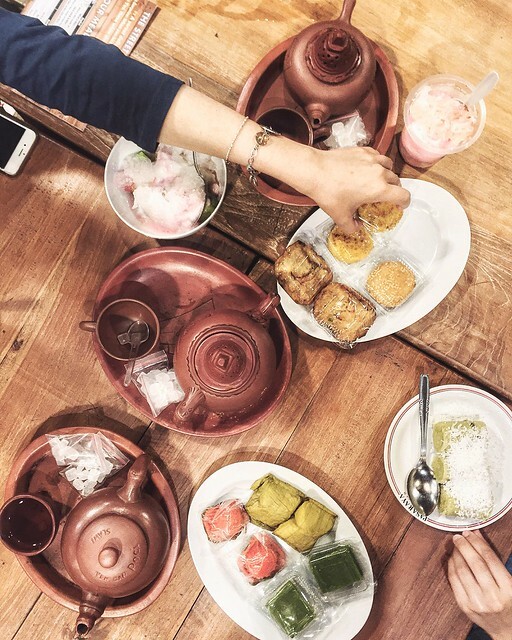 As for your beverage, wash the food down with a nice pot of Teh Poci – their local tea served in terracotta teapot and cups accompanied with bits of rock sugar. 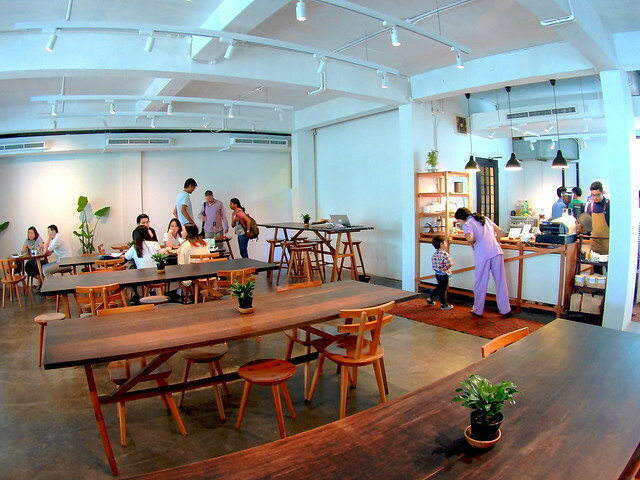 If you are looking for a good cup of coffee, then head to 1/15 Coffee which is one of the first coffee places to provide specialty coffee in Jakarta. 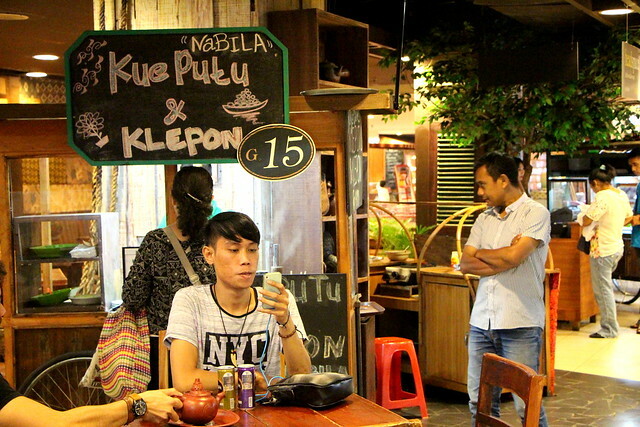 Coffee is a well-respected industry in Indonesia as it has played an important role in the growth of the country’s economy. 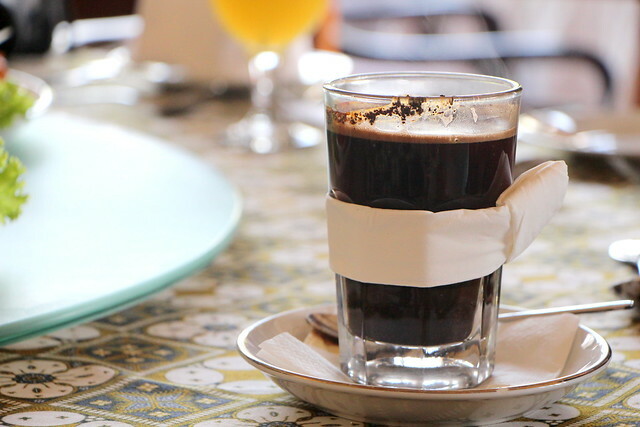 Indonesia’s affinity with coffee can be traced back to its colonial era, and in 2014, Indonesia was rated as the fourth largest producer of coffee in the world. 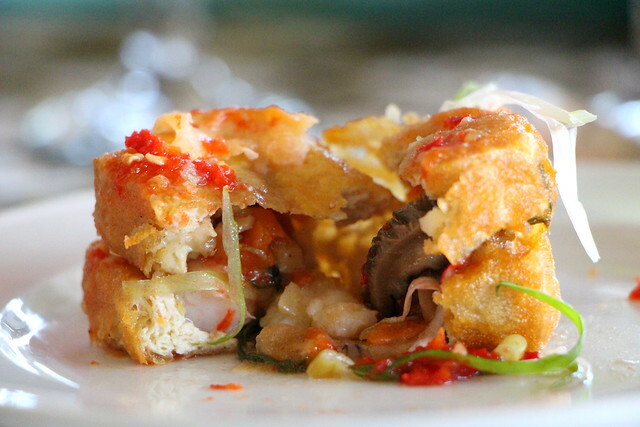 When in Indonesia, you’ve got to try their Indonesian pancake! 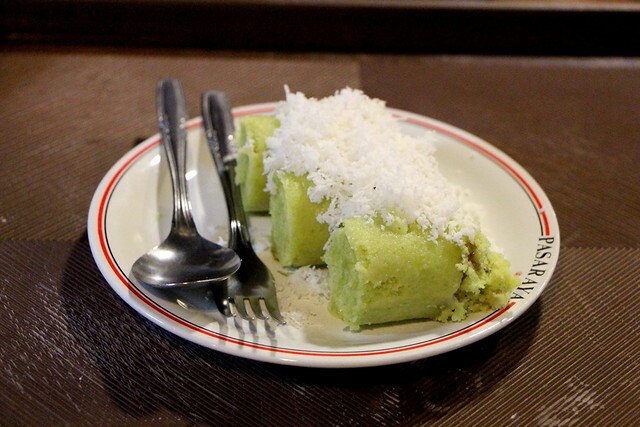 Their thick pancake is heavily buttered and resembles our local min jiang kueh in terms of its texture. 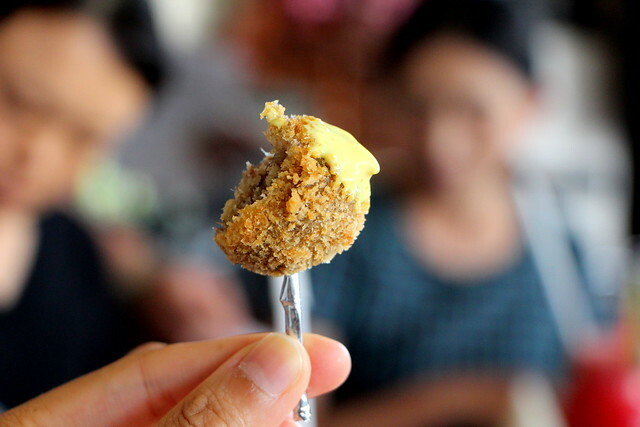 The thin one, on the other hand, is sinfully deep-fried and absolutely crispy and delicious. 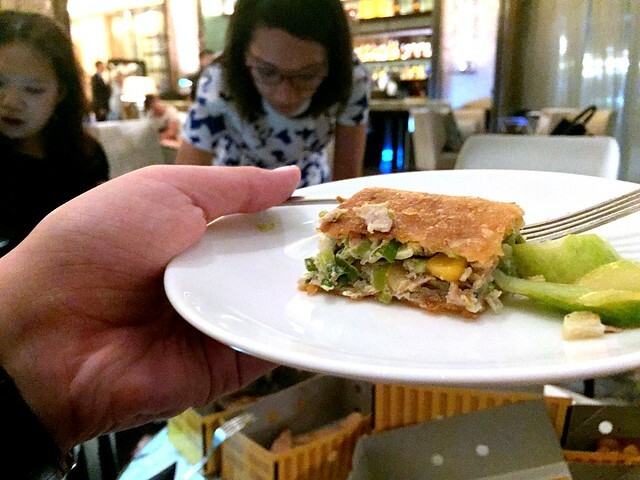 Martabak Boss is one of the famous Martabak franchises in Indonesia offering a variety of flavours from savoury to sweet, and one of their outlets is located a mere three-minute walk across from Gandaria City Mall. Enjoyed this article? Share it on Facebook! 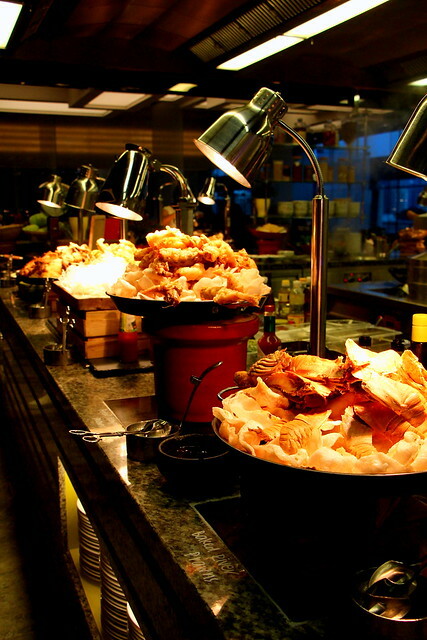 This post was sponsored by Sheraton Grand Jakarta Gandaria City.